Happy 48th, Singapore! Many Happy Returns! Ultimately, the basis for our patriotism is emotional. There’s just this emotional connection that we feel, and when we celebrate National Day, we celebrate this emotional connection. No country is perfect, and Singapore is no more or less imperfect than other country. By sheer choice of deciding where we want to belong, individual and national identities co-mingle, and it’s on that basis individual Singaporeans come together and decide to celebrate National Day. I don’t want to overstate how good or bad Singapore is, but to state some of the facts: material growth contrasts with growing inequality; education anxiety is as high as ever with more tuition centres; I don’t know if the the structural unemployment is more or less of a problem; our transportation system is expanding – the “step” improvements in capacity contrasts against the creeping increase in population. And here I speculate: I wonder if the physical constraints lend themselves to a zero-sum sense of the world. I would think so, and as I read Edward Glaeser’s Triumph of the City, I come to terms with how the impulses for environmental and historical preservation can be opposed to the need for development, and to keep housing affordable. Supposing if, one day the pretty shophouses at Katong have to make way for more high-rises for an increasing population to keep housing costs affordable – what then? Despite the genius of Singapore’s urban planners, there still is only so much that can be done, and very difficult choices have to be made. Today one of the choices is already before us: that the Cross-Regional Line will be cutting through the Bukit Timah Nature Reserve, and the Nature Society has already provided a report and alternatives about the routes that the line could take. If the land transport agrees to the alternatives, it can be seen as having compromised to environmental interests. Yet in another way, Singaporeans and future passengers of the CRL would also have won – to be able to both enjoy nature, and to enjoy cheap and quick transits across the island. In a physical sense, some of the choices are indeed zero-sum. In policy and national issues, the central frame can appear to be zero-summed – that the gains of someone must mean the loss of another. The rat-races in education and materialism (5Cs) also demonstrate the zero-sumness frame – that the achievements of someone means someone else’s loss, or even my loss. Rankings tend to have this framing – everyone has ‘their place’, and one can only progress at the expense of another. If Singapore should thrive in an uncertain future, then we’ll all have to progress together. People live in families, in communities, and in societies. No one truly lives alone, and no one is truly independent of another, or totally self-reliant. Being reliant on others isn’t so much a personal fault as it is a necessity: how can we live relying only on ourselves? My own thoughts are that Singapore’s future progress will come from what Singaporeans will give to each other, particularly those who have been marginalised, and neglected. Some of them might not even be Singaporeans, and we’ll still give all the same. This spirit of giving, of accepting compromise and to do so in amicable ways, could define the way the big G deals with people, communities and organisations and shape the future to come. Here’s to many happy returns. Happy 48th. Edit: There won’t be a post over the weekend! Happy Long Weekend, Singapore! 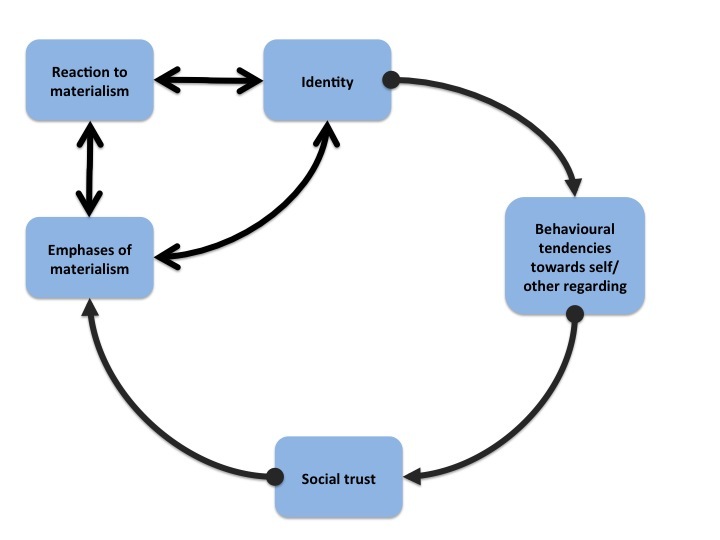 I’ve been wondering about the relationships between materialism, personal security and self identity, and the cultural attitudes in society. How firmly do people believe that material possessions are an important source of identity? Where do we get the sense of attachment from? And how does that relate to how we interact with other people? Do we believe more in closed zero-sum interactions (as being Kiasu could imply), or in more open, non-zero sum interactions? Singaporeans are surrounded by material abundance, but to as phrased by Laurence Lien, we could be in a “social recession”. How is this possible? I don’t know. How is that the material abundance we have is not clearly evidenced in the abundance of compassion and spirit? 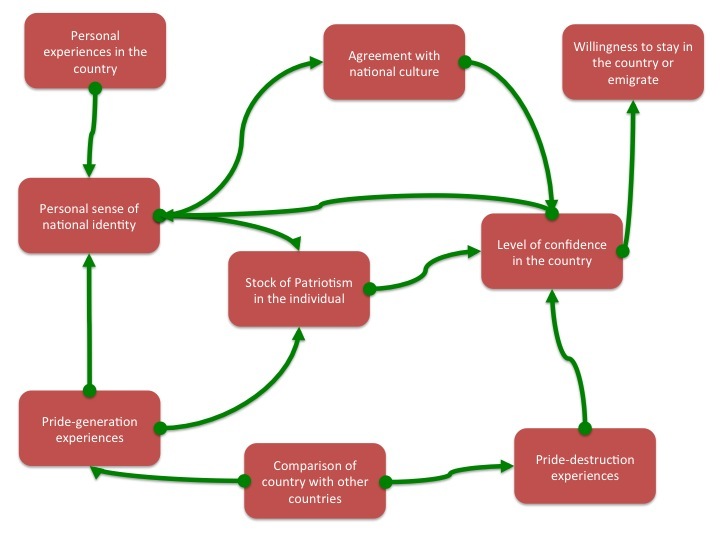 The map of the week is about patriotism. 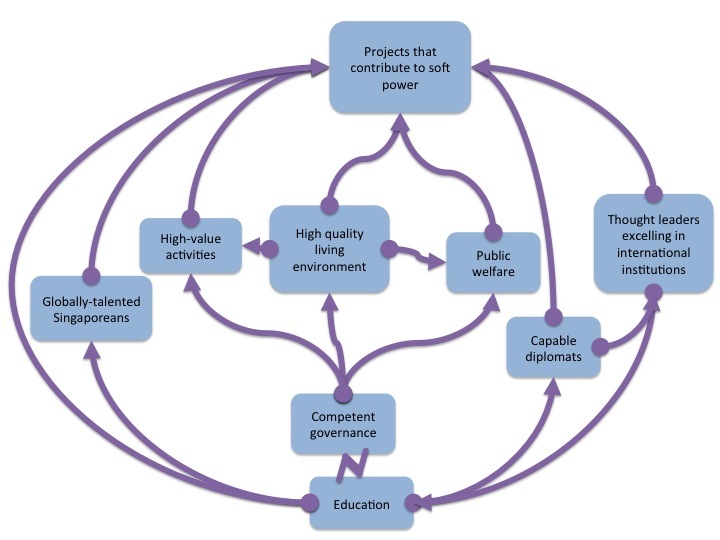 This is a purely-sentimental driven map, although things like economic opportunities could be interpreted in terms of the pride and identification that one has with the country, as with “I appreciate the opportunities I have in this country to realise my abilities”. In a similar way, ownership of property can also be interpreted in the same vein, as with, “I appreciate the fact that I can own my own home.” And then there are pride-destruction experiences, such as losing confidence with the political leaders, losing employment, seeing discrimination perpetuated by authorities of one form or another. This isn’t specific to any country, and I guess the weights of countries will be different. 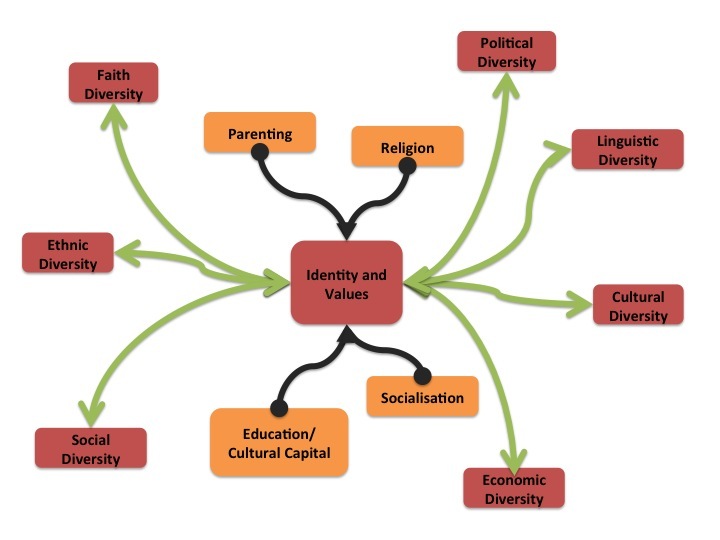 In others, the identification with a local or a national culture (if one exists at all) could be more important than pride for the local region or community. This week, it’s something micro. 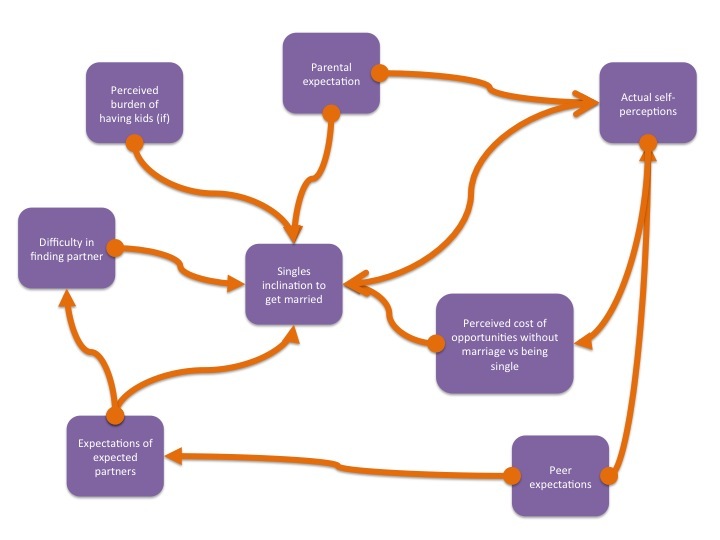 This is a hypothetical relational map about what goes in when couples are deciding whether or not to get together. We take for granted that lifelong-monogamous relationship with one partner has been the not-so norm among human institutions. I say, “not-so” norm because it’s an ideal thats routinely broken – no one can point specifically to an age where lifelong monogamous relationships happened without occasions of adultery (by either gender). I realise that many of these things are legal developments too. Should laws conform to the attitudes and conventions of the current age, or should they reflect some notion of rights? The former could be used to justify racial segregation in the US; the latter might be too unrealistic for acceptance by ALL sectors in society. What then, what next? The last point is methodological: I admit that a lot of the variables or qualities or concepts usually assume the rational person, in making decisions using some notion of cost/benefit analysis, and reduce the weight of other factors. What I’ve tried to do usually, is to factor in social expectations as well – and this is one way to incorporate the non-rational, or non-economic rational. I still think this encompasses the way we make choices, that we do consider a lot of the variables together, but the framing of these variables matter. I think what a systems-based representation does is to clarify at which point of decision-making does the framing matter. They could come at the initial process of scanning; at the middle part as they get processed; or at the end as they consider preliminary impact of the choices guided by the framing. Of course they could also happen at every/any stage of the process too. There’s no good way, and it’s up to the individual analyst to choose where does framing matter the most, or if it’s in the background of things. I’ll be away over the weekend, so I’ll posting this early. I look at soft power, and try to break it down into its constituents. This is at best, a guess of what soft power might comprise. In this short analysis, soft power just means running a country well and getting admiration from other people. As long as the basics can continue, Singapore will continue to be a “net exporter” of soft power.